A while ago I took out an old UFO, and decided to finish it. It is a hand stitched wool bodice lined with linen, fully interlined, and boned in front. It also laces in front over a half boned stomacher. (Meanwhile, that was a good invention – so easy to adjust to size!) The bodice is of good quality, but not quite historical. For other costuming adventures it would be perfectly fine though. As I don’t see myself having much use of it, I mean to sell it. Still, it is nice to have good pictures of the things you’ve made, and I hope that good pictures will make the bodice more desirable for potential buyers. To show that this simple bodice can work for a variety of characters, I’ve had two little photo shoots this week. In Sweden there is a popular LARP series called Krigshjärta (War Heart). It has several different cultures, with very different religions/ideologies, social life, politics, and, of course, dress. Though I’ve never attended a LARP in my life (though I have lots of friends who do so frequently), I have always been a bit intrigued by one of the peoples, the Jorgaler. This people are a highly religious group, who see it as a severe faux pas to outshine what their god has created, and thus dress in a very simple way, keeping trim and decorations to a minimum, almost glorying in what is lowly as it where. 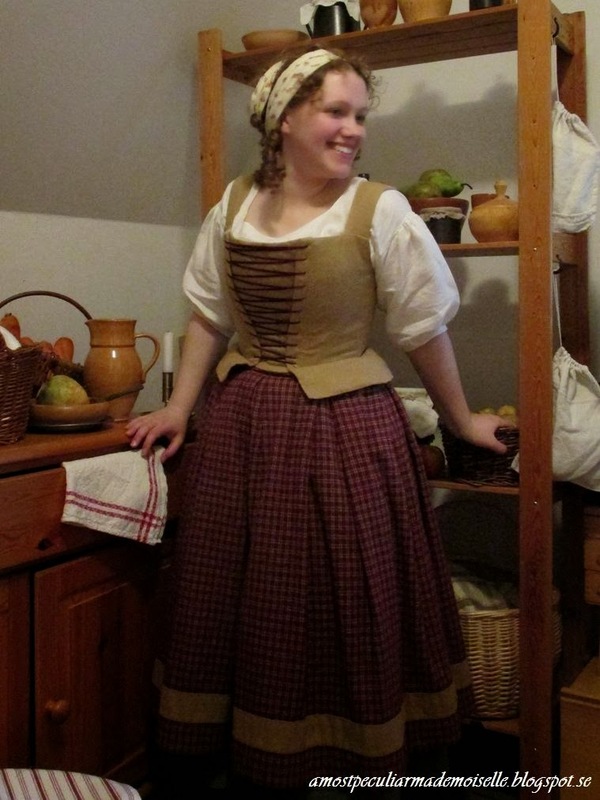 Bodices and skirts/dresses are worn by the women, as are some form of kerchief on their heads. Tobias and I considered going to one of the Krigshjärta LARPs and play a couple of Jorgaler when we were newly-weds, but what with pregnancies, babies and life in general, that never happened. I was still interested in composing such an outfit though, to see if I could make plain look pretty. So I had the bodice. The rest I was pretty sure I could dig out from my historical clothing and fantasy costume wardrobes, and my fabric stash. It worked rather well I think. 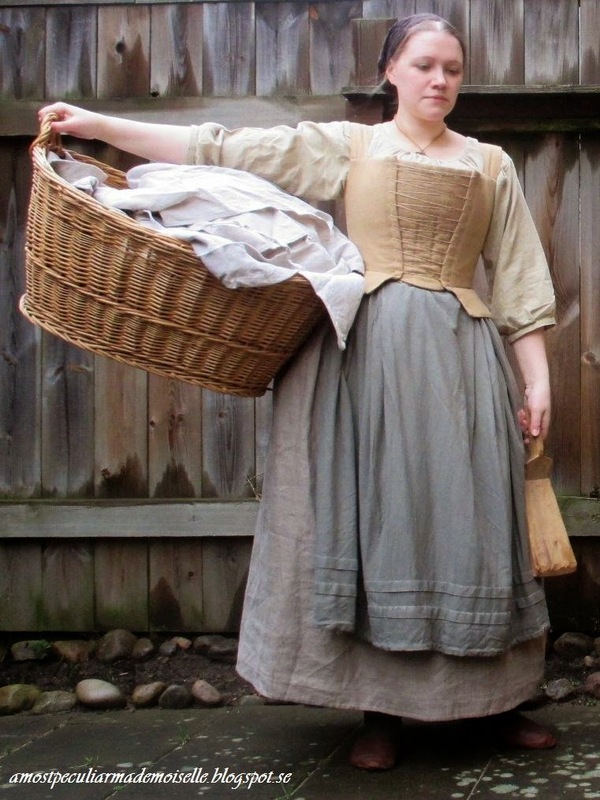 I used the same old hobbit shift, an 18th century linen petticoat, a raw silk skirt for the apron, and a piece of fabric for the kerchief. 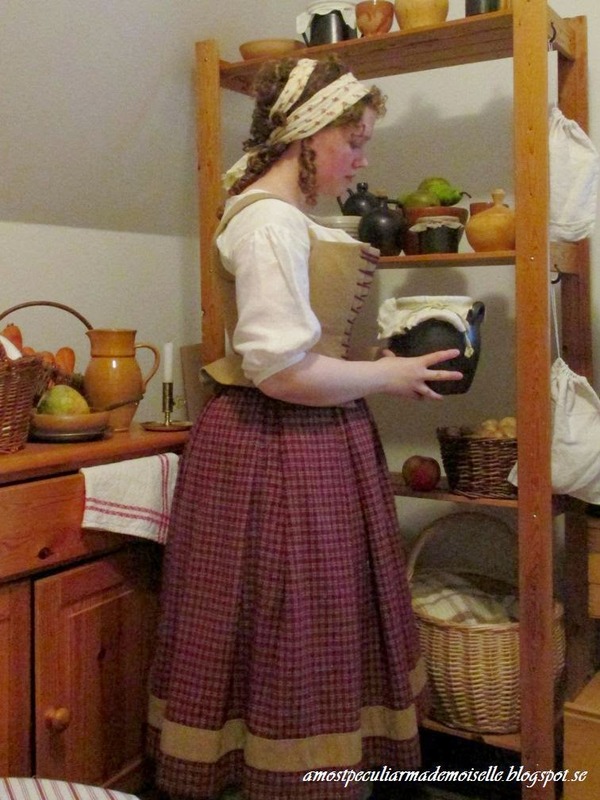 Medieval wool hose and leather shoes completed the outfit. 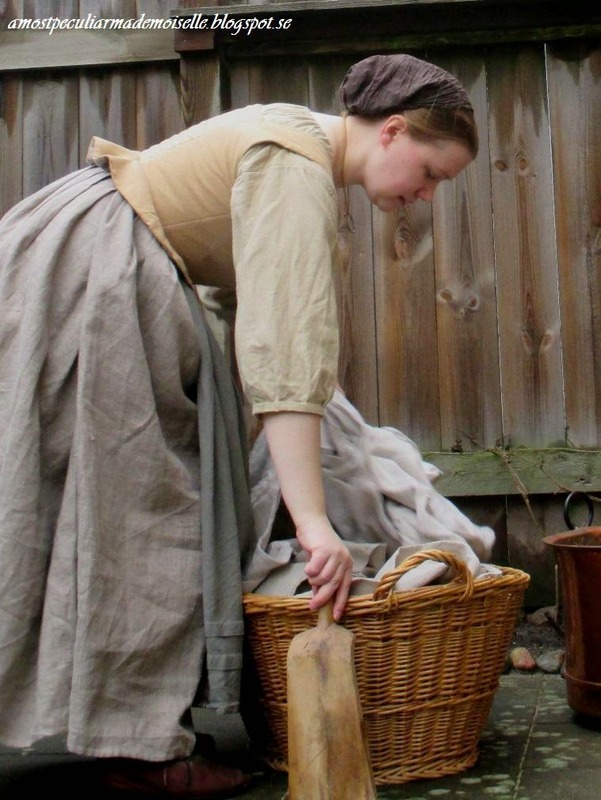 As props I used an old laundry basket that usually holds toys, an even older washing bat, an inherited copper tub, and several historical linen shirts, shifts, braies and aprons. I lugged it all out in the garden and took pictures using the trusty self timer, a dear friend when documenting my costuming adventures. 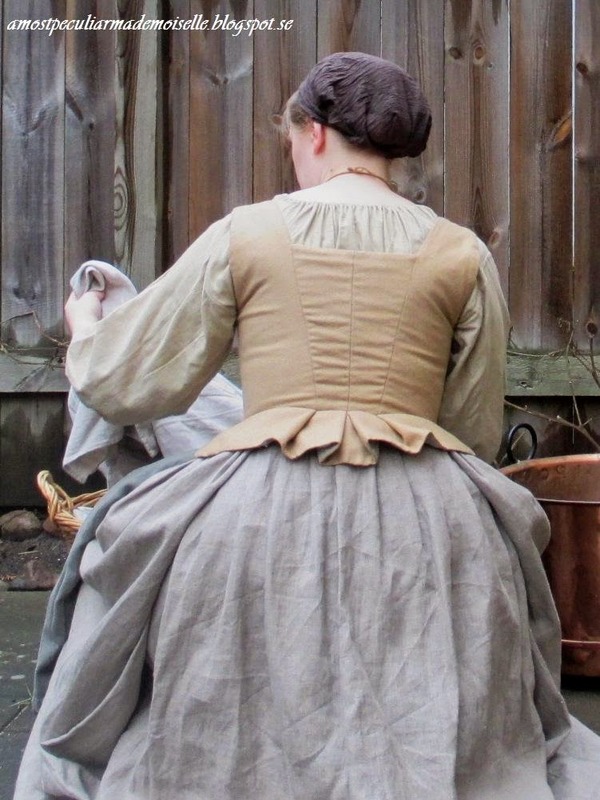 I like how the bodice looks very plain and… almost boring really, when laced with a neutral cord. It doesn’t attract any notice at all worn like this. Actually, I love this outfit! It would have looked better with a wool skirt though, and a larger kerchief. 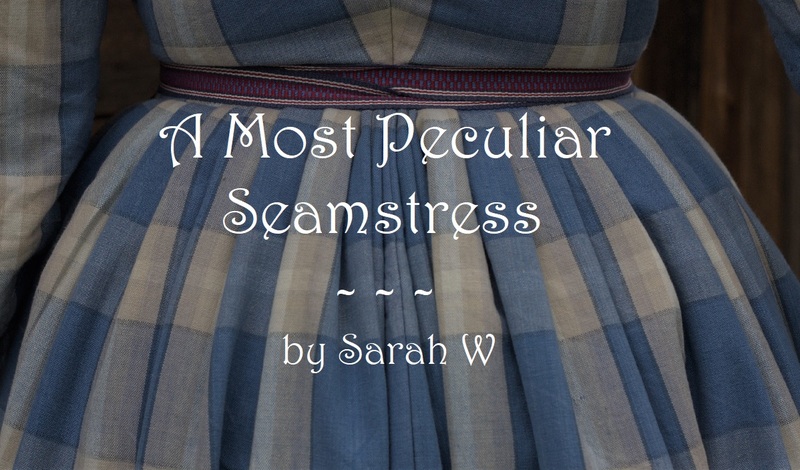 I wore an 18th century-ish shift, two petticoats that are hardly seen, the wool skirt, and some fabric from the stash in my hair. Conclusions: colours make a lot of difference; it transformed this simple bodice from being dreary to being delightful. Så himla fint! Det blev en väldigt fin hob framförallt. Första hobbilden är så fin! Den andra dräkten är också fin på sitt sätt. Jag gillar det enkla. What are the measurements for this bodice? Also how much? I LOVE this! Both outfits are adorable but I love the hobbit outfit. Did you bone/interline/stiffen the bodice? So beautiful. Such a versatile bodice! shpgr: the shipping from Sweden would be very expensive, so I plan to sell it within the EU, most likely within Sweden. Sarah Jane: I should have mentioned that. I've added the info to the original post, but yes, fully interlined, with the front and stomacher boned. Thanks 🙂 Much as I love researching and making historical clothing, it's fun to something different now and again. Oh, I like that notion of changing a look with a cord! These photos demonstrate that beautifully (aside from the overall change, of course). And as a person who's loved Tolkien's writings since early childhood, I'm really fond of your larder photoshoot! That corner actually almost does look like part of a hobbit hole, with the low / diagonal ceiling (I'm sure there's a better word for it, but I can't remember it). 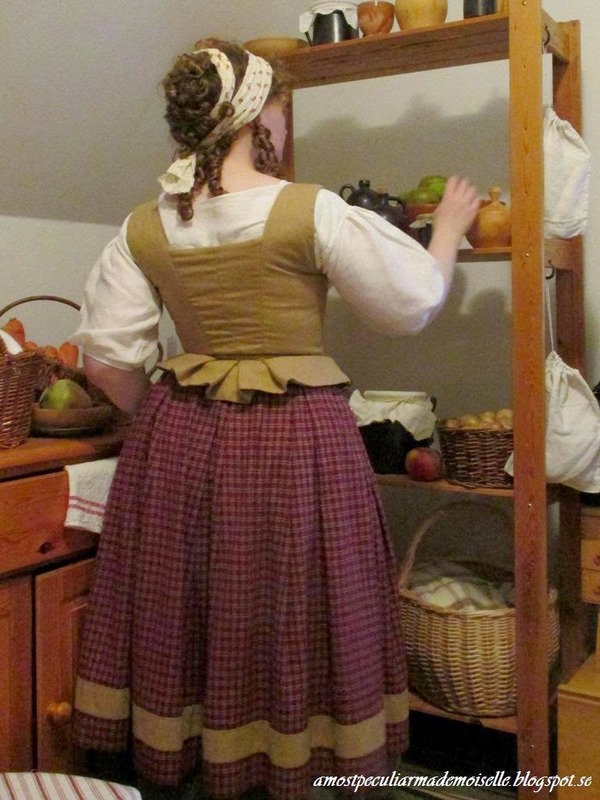 And it's nice to see how a historical wardrobe transforms into a fantasy one! I actually like the hair with it, at least in some of the shots, but I may not have as strong historical expectations. It isn't necessarily historical; it's otherworldly, more. But, I somehow got the notion from the books that hobbits wore their hair down or something (not sure why I thought/think that). Yes, that corner did seem suitable for the purpose. Not perfect, but good enough. I don't think it says anything about hairstyles; all we learn is that they have curly hair, and from the frequent mention of hats and hat sizes, I suppose headwear was common. For one of my outfits I did make a bonnet for this reason. To wear your hair out seem very impractical for all the manual labour hobbits, as an agricultural people, certainly do.